I have only two photographs of my grandfather David Robert Corryn Morrice – the photograph above of him in uniform and a later photograph taken at my parents’ wedding during the second world war. I had always assumed that this was a military uniform but I was soon corrected by my friend, and now collaborator, Wayne Osborne who identified the uniform as being that of a Special Constable in the City of London Police. The Police Long Service medal dated the photograph to the early 1920s but despite extensive investigations I have not been able to find out anything more about his police service except that my mother remembers him going to police ‘parties’ at Lavender Hill station in the 1920s. 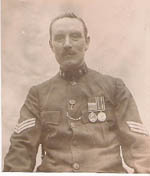 The second medal was quickly identified by Wayne as the Queen’s South Africa medal establishing that he had served in the Boer War. My mother also confirmed that he had occasionally talked of Johannesburg. Kevin Asplin’s excellent Military History Resources soon revealed Robert as Trooper 22255 Morrice of the 81st Company the 21st Battalion Imperial Yeomanry – the 2nd Sharpshooters. The Sharpshooters were a volunteer unit which was supposedly made up of those that could ride and shoot expertly but it is still not clear to me how Robert acquired these skills on the crowded streets of Islington. The next port of call was the Kent and Sharpshooters Yeomanry Museum in Croydon as the 21st Battalion was ‘perpetuated’ as the 3rd County of London Yeomanry (Sharpshooters) – a forerunner of today’s of C (Kent and Sharpshooters Yeomanry) Squadron of the Royal Yeomanry. At this point we first encountered Colonel Alexander Weston Jarvis through his papers and diaries. 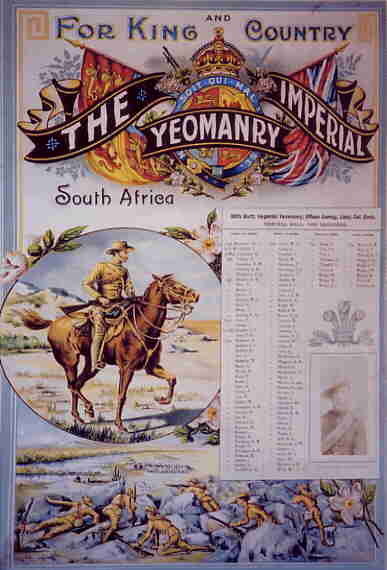 The hope in reading the Boer War diary was that there would be some mention of Robert but it soon became obvious that troopers were only mentioned if killed or disgraced in some way. However, the diaries proved to be intriguing as they revealed that Weston Jarvis was a major socialite as well as a soldier of some experience and standing. I have learned little of my grandfather except that he had the misfortune to contract enteric (typhoid) on Christmas Eve 1901 and was invalided home. I did however gain some understanding of the operations carried out by the battalion as part of mobile columns chasing the Boers and building and guarding of the blockhouse lines as they spread across the Transvaal. Weston Jarvis is a character from another century and I have followed his exploits, military and social, with growing interest so that I now have great respect for an over-achiever who was well-connected to everyone that mattered in society and government. His autobiography is titled ‘Jottings from an Active Life’ – an apt description of his time as an MP, as a soldier in the Matabele, Boer and First World Wars, an enthusiastic member of the hunting and fishing fraternity and accompanying the Royal Family on overseas tours.